The King Koil Spinal Delight 3' Divan Bed is a Chiropractor Approved Back Support Bed. This orthopaedic bed has a stong and supportive open coil spring interior mattress with high density filling layers for long lasting performance. The turnable mattress has a firm feel orthopaedic contruction and the divan base is platform top, making it ideal for those in need of additional back support. 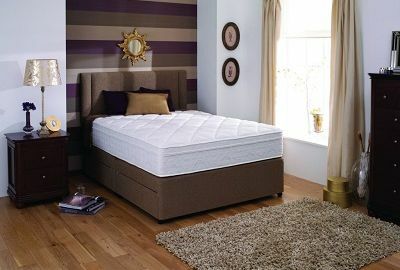 The King Koil Spinal Delight 3' Divan Bed is a Chiropractor Approved Back Support Bed offering Enhanced Spinal Care and Unrivalled Posture Support. Combining a High Guage Open Coil Spring System with High Density Filling Layers for long lasting performance, the orthopaedic mattress benefits from a Perimeter Frame with Flex-edge Border Supports for full surface non-sag sleep comfort. Ideal for those that require additional back support, the Chirobar Interior Mattress has a Firm Feel Orthopaedic Construction and is Suitable for both Divan Bases and Bedsteads. The King Koil Spinal Guard Single Bed comes with a Platform Top Divan Base with a range of Drawer Storage Options. With the added reassurance of a Substantial 10 Year Guarantee, the Spinal Guard Bed also benefits from Free Delivery* and Free Collection and Recycling of Your Old Bed throughout Northern Ireland, and Counties Monaghan, Louth and Dublin, in the Republic of Ireland.